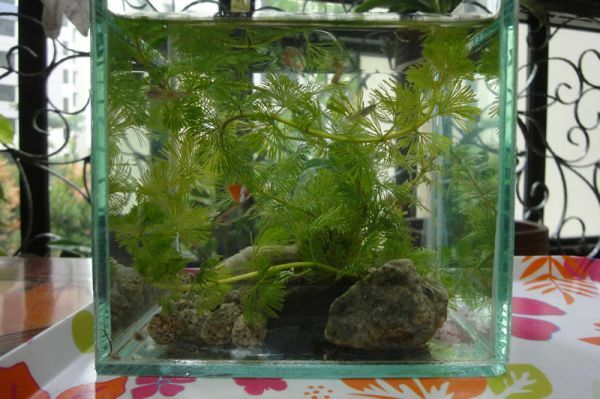 Dot’s aunt gave her a little fish tank with five little fishes in late September 2011. J and I were a bit hesitant then as we did not know whether Dot would be able to handle them with ‘care’. Seeing her excitement when she saw the little fishes, we relented and she had her little fishes brought home safety. We teach Dot to feed the little fishes twice a day and she has been happily doing it so far. 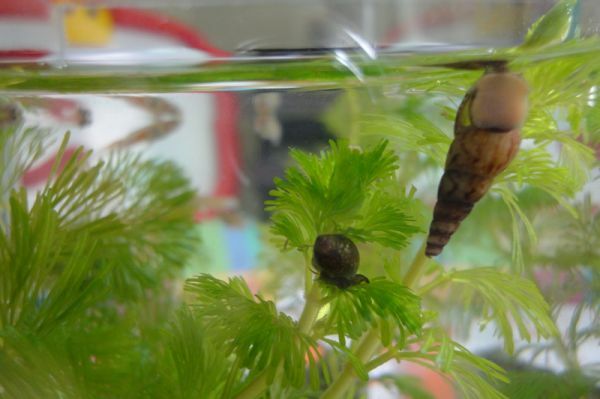 Caring for little aquatic pets teaches Dot responsibility. Once, she dipped her little dolphin, a plush toy, into the water, probably thinking that it could swim! 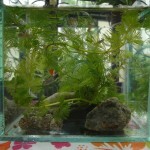 Some of the fishes we had did not survive and J decided not to buy anymore fish. Instead he decided to catch some little fish from the canal near his parents’ place. 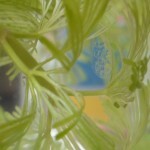 We went and caught a bag of little fish and some snails to fill our almost empty fish tank. All of us are so happy to see our little aquarium brimming with life again! A bag of fish and snails that J caught for Dot! 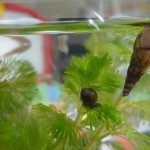 One of the snails is going to lay eggs. 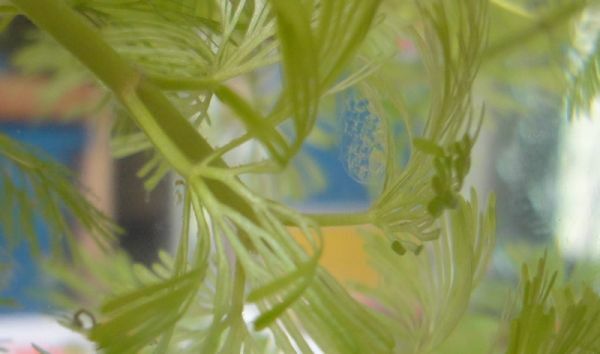 Jelly-like eggs are resting on the aquatic plant. Can you spot them? I am very fascinated by the little snails. Once I spotted one of the snails literally diving to the bottom of the tank. I have never seen a snail dived! So amusing! Today I see jelly-like things on the aquatic plant and realize that they are clusters of eggs, most likely laid by the snail. I am eagerly waiting for the arrival of the little ones but what are we going to do if our little tank is full of baby snails?